At this year's Greenbuild in Boston, we saw a range of exciting solutions for building, renovating, and remediating the built environment. From anti-bacterial paints to acoustic fabric that reduces solar gain, we highlight six products that are truly innovating the industry. 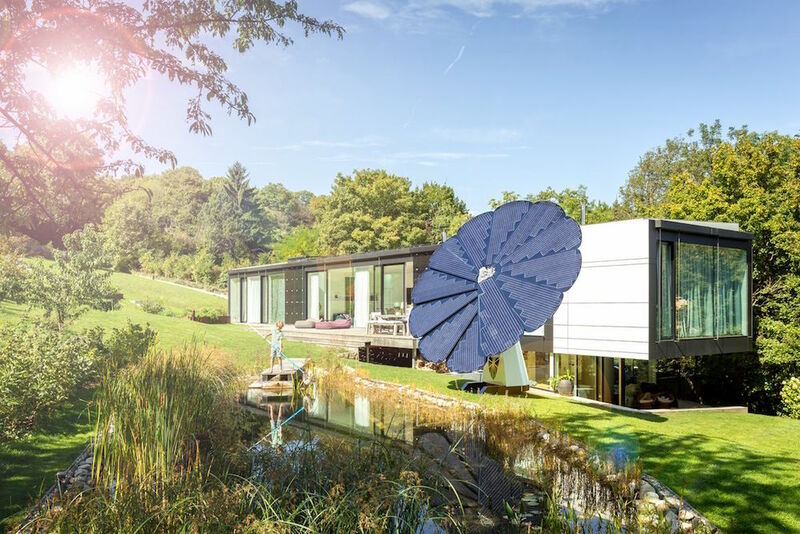 SmartFlower Plus SmartFlower Solar This flower-shaped solar panel system is equipped with an integrated battery storage system that allows you to generate solar energy efficiently and store excess energy for later use. It can be used on-grid for optimization (and power outage), as well as off-grid and hybrid thanks to the battery storage capacity. Paint Shield Microbicidal Interior Latex Paint Sherwin-Williams Germophobes, rejoice! The first EPA-registered microbicidal paint that kills greater than 99.9 percent of Staph (Staphylococcus aureus), MRSA (Methicillin-resistant Staphylococcus aureus), E. coli (Escherichia coli), VRE (Vancomycin-resistant Enterococcus faecalis) and Enterobacter aerogenes within two hours of exposure on painted surfaces. It continues to kill 90 percent of these bacteria even after repeated contamination on painted surfaces and lasts up to four years. InstaGreen GT-4 Tray Hydrotech This green roof application creates water storage for stormwater management. It features perforated sidewalls to encourage tray-to-tray root growth and a base with a reservoir storage to accommodate large amounts of water and aeration. Cafe Series greenscreen Heed-A-Maric is a family of boxed-planters that comes in rectangular, curved rectangular, and square boxes that can be combined to create winding and curving plant-rich environments. It is available in 20 colors. Corbelle Kohler The Corbelle two-piece toilet delivers the “most complete flush ever,” with swirl flushing that keeps your bowl cleaner longer than a conventional flush, using less water. Installation is made easy by the seamless skirted trapway that attaches to the floor fittings, eliminating the need to drill holes. CMP25 - ALU 6010 GKD Made of gold-anodized aluminum, these acoustic composite panels absorb 88 percent of sounds and reduce noise by 85 percent. The fabric combines metal mesh and aluminum honeycomb plate, making it extremely stable and resistant to bending. It allows for improved and more even daylight distribution, thereby helping to reduce the amount of energy required for artificial lighting. According to the trend-setting powers at Pantone and Sherwin Williams, we'll be looking at the world through rose(ish)-colored glasses in 2015. To combat the cold, dreary winter months—goodbye Seasonal Anxiety Disorder!—two new colors belonging to the warm and vibrant palette of pinks, reds, and oranges are expected to saturate 2015. So what's next year's official color of the year? Without further delay… the “robust and earthy” Marsala (Pantone 18-1438) has been named Pantone’s 2015 color of the year. It will, according to the company’s website, “enrich our minds, bodies, and souls.” While this color promises such profound fulfillment beyond mere aesthetics, it does have more versatile and practical uses, which “translates easily to fashion, beauty, industrial design, home furnishings and interiors,” said Leatrice Eiseman, executive director of the Pantone Color Institute, in a statement. Furniture companies, like BoConcept, have already launched designs in this “hearty yet stylish” shade. Not to be outdone, Sherwin-Williams has also released its own color projection for 2015. A related, yet different tone than Marsala, Sherwin-Williams' “carefree” and “optimistic” shade of Coral Reef was named 2015 color of the year by the paint company. This shade is part of the Buoyant Collection, and hints to better times. “After weathering the recession and finally seeing signs of growth, the Buoyant palette reflects our enthusiasm with colors that evoke big, bright floral designs and inspire consumers. Our spirits echo the optimism following World War II when GIs returned from exotic locales, bringing tropical prints and tiki-inspired looks,” said Jackie Jordan, director of color marketing at Sherwin-Williams, in a statement. Who knew the economy and color forecasting were so intertwined? This multipurpose shade is equally suited for the young and old, explained Jordan. “Coral Reef can be used in a dining space within a senior living facility or on the wall of a multi-family game room,” said Jordan. “This tropical color lends itself well to hospitality settings, especially in warm climates such as Calif., Florida and Hawaii.” As the saying goes, everything is coming up roses... at least for 2015. Communicating information—both the visual and verbal varieties—in an accurate, timely fashion comprises the heart of any construction project. There are myriad programs and apps on the market that offer to streamline design problems, decision making, and materials selection. Here are some new tech tools that we think really make a difference. 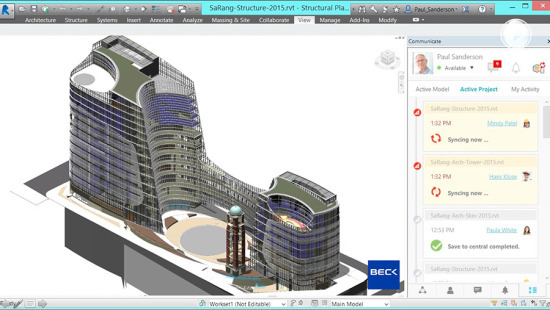 Autodesk A360 Collaboration for Revit Autodesk Overcoming the barriers of corporate firewalls and physical location, A360 Collaboration for Revit enables true centralized access to Revit models by team members in all disciplines from multiple firms or sites. It also replaces work-arounds for sharing models such as use of FTP sites, sharing software, or inefficient use of email with PDF attachments. As a cloud-based service, the software does not require costly or complex IT setup and maintenance. ViraconGlass Viracon This app allows users to select from twenty-five different coatings on fifteen substrates, presenting transmitted and reflective glass color on a variety of building types. The models can then be viewed under different lighting conditions from both interior and exterior perspectives, and can be compared to one another. Field Assets InfraWorks 360, Autodesk With this program, owners and operators will be able to collect, mark-up, and share date on infrastructure assets in real-time so teams can make better-informed decisions on how to deploy their field workforce for asset inspection and maintenance, key to optimal productivity and financial performance. SIMplexity Launch LT Introspective Systems This software enables architects to uncover and prioritize the underlying goals of each project, and create a road map from inception to completion. It captures data associated with a project in any format (email, video, images, databases, spreadsheets, PDFs, and more) and connects each piece of information to its role within a job—owner request, regulation, LEED target, or any user-created category—to produce a 360-degree view of the project. HD Home Viewer Cosentino This design tool allows users to change the materials by clicking on virtual countertops, facades, wall coverings, floors, furniture, and bathroom elements to visualize surface clad in the entire range of colors and finishes of Silestone quartz, Dekton ultra-compact material, and recycled Eco. HD Home Viewer is based on HTML5, permitting use on all portable and desktop devices running Android, iOS, and Windows. ColorSnap Studio Sherwin-Williams This iPad app makes it easy to find the closet-matching paint colors within an image and to fine-tune colors using lightness, saturation, and hue features. The Color Visuallizer toole facilitates experimenting with thousands of color combinations by applying color to an image without complicated edge-masking: Simply touch the color and "fingerpaint" the hue into the image. In the midst of Greenbuild's International Conference & Expo, held from November 18–22 in Philadelphia, AN sought out the newest and most innovative sustainable building products. We found attractive new finishes and furnishings, including a new chair derived from carbon polymers, and a plethora of building components that aim to harness the Earth's energy for optimal building performance. 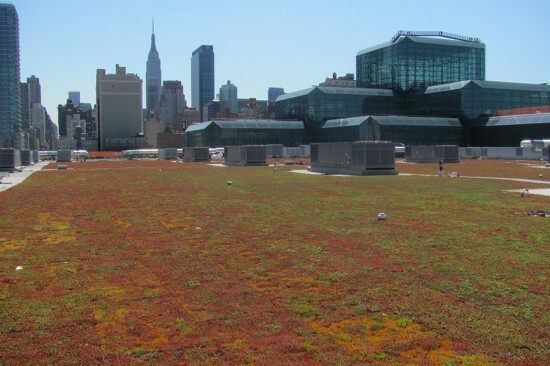 Green Roofing Xero Flor America This vegetated green roofing solution (above) rolls out in a mat system for easy application, as well as rapid access for repairs. Each 40-inch wide panel is comprised of a root barrier, drain mat, water retention fleece, growing medium, and pre-vegetated layer of sedum. Also known as stonecrop, each order is grown in one of Xero Flor's six regional fields, so living roofs are acclimated to the installation environment and contribute to local LEED credits. Ecoflex Mortise Lock Assa Abloy The Ecoflex Mortise Lock runs on only 10 Watts of energy, whereas standard electrified locks draw nearly twice the wattage. Used as a stand-alone electronic access control or in conjunction with a wall reader, the reduced power draw cuts operating costs and its actuator reduces the risk of failure from voltage drops. Basotect BASF Basotect is made from an open-cell melamine resin foam, a thermoset polymer that does not contain mineral fibers. It is comprised of 99 percent air for maximum sound absorbancy and low density (read: lightweight) in corporate, education, civic, and institutional applications. Smog-Eating Tile Boral Suitable for both commercial and residential applications, concrete roofing tiles feature an embedded finish that converts nitrogen oxide from the air into inert compounds. For a recommended 3-inch headlap, approximately 89 tiles will cover 100 square feet. Six colorways are available in three profiles. Fleece-BACK PVC Membrane Carlisle SynTec Systems To bolster durability and the PVC membrane's puncture resistance, a layer of fleece backing adds thickness up to 135 mils and improves wind-uplift performance when bonded to an adhesive. Specified as part of a comprehensive roofing system, the membrane can help contribute to LEED points, as it did on the South Terrace of the David L. Lawrence Convention Center in Pittsburgh. AirRenew CertainTeed CertainTeed's new gypsum board features embedded air purifying technology that captures formaldehyde and other aldehydes, converts them into inert compounds, and stores the particulates within the board for 75 years. Water-based acrylic and epoxy paints or breathable wallpaper will not affect efficacy, and AirRenew can be recycled at the end of its useful life. Enverge Cavity Wall Firestone Building Products Firestone adapted its polyisocyanite roofing technology and its insular properties for the vertical surfaces of a building with the Enverge Cavity Wall system. When combined, a suite of products—including a continuous insulation exterior wall insulation, air and vapor barrier, and thru-wall flashing—stops thermal bridging and optimizes building envelope performance according to ASHRAE standards. Reveal Glass Guardian Industries Guardian Industries' switchable glass features an interlayer of liquid crystals laminated between two sheets of glass that, when exposed to an electrical current, reconfigures floating molecules into a transparent grid pattern that appears clear to the naked eye. When the system is off, the molecules rest in a disorganized, natural state that lends opacity to the glass. The line is available in any of Guardian's color offerings, standard textures, and Berman Glass editions. 1630 SS ISO Kawneer Kawneer addresses the growing frequency of high-impact weather systems with a curtain wall designed to withstand hurricane and tornado conditions. The system has withstood blast mitigation testing, ASTM testing, and met building code standards for Florida's hurricane-prone Miami-Dade County, all with a reduced U-factor to meet current energy code demands. Grazie with AirCarbon KI KI's Grazie stacking chair was reimagined in a bio-based polymer(above)—AirCarbon—from California-based Newlight Technologies. A patented production method isolates carbon molecules from naturally occurring chemical compounds, converts them to a liquid state, and bonds them with polymers for a carbon-negative thermoplastic that can be substituted for oil-based plastics. Benchmark Kingspan Panels finished in ACM, MCM, ceramic, brick, and more feature polyisocyanates to eliminate thermal bridging, and a built-in vapor barrier for an air-tight building skin. Kingspan has developed EPDs for all Benchmark panels, which are also UL listed. MagnaShade MechoSystems Mechosystem's interior daylight management—in both manual and automated systems—is available in lengths as long as 40 feet for uninterrupted glare and heat gain mitigation, and the elimination of light gaps. A slim profile on the 6 1/2-inch housing cassette can be installed flush within a ceiling or soffit, or wall mounted. PermaLED Area Light Osram Sylvania Operating at 90, 140, or 200 Watts of power, the PermaLED luminaire for outdoor use generates a 57 percent energy savings when compared to HID lamps. Available with a standard photosensor or a dual-technology motion and photocontrol sensor, the latter provides up to 10kV surge protection. SPEEDHIDE zero PPG This topcoat paint contains no VOCs, formaldehyde, crystalline silica or ethylene glycol. Anti-microbial properties also help inhibit growth of mold and mildew on paint film. SPEEDHIDE zero is GreenGuard Gold certified and meets standards for California's South Coast Air Quality Management District (SCAQMD). Harmony Sherwin-Williams Once this interior acrylic latex paint dries, a propriety chemical compound neutralizes aldehydes in the surrounding environment without the presence of a catalyst. Harmony, and 50 percent of Sherwin-Williams' paint offerings, have been certified GreenGuard Gold and contribute to LEED points under Version 4 revisions. ThermaCork Eco Supply Made from the bark of the quercus suber tree, ThermaCork features the inherent dimensional stability, water resistance, fire retardant properties, and acoustical isolation of cork, without additives. To form panels, the sap of the cork bark, or suberin, is heated to a liquid state and, once cooled, binds particles in place. The panels can also be applied as insulation. The Hollywood sign, whose facelift we've been tracking in recent weeks, has been fully restored. After nine-weeks of priming and painting, the nine shiny white letters are once again the talk of Tinseltown. Thanks to Sherwin Williams and the Hollywood Sign Trust, who funded the facelift, the 45-foot-tall letters gracing LA’s Mount Lee are all set for its upcoming 90th anniversary celebration next year. And if you missed it in person, check out the time lapse video documenting this milestone below. Like any star of the silver screen, a facial peel is in order every now and then. For the famous Hollywood Sign perched atop Mount Lee overlooking Los Angeles, it's been 35 years since its last facelift, but the 89 year-old historical landmark will soon look as young as ever. Last week, the restoration project passed the halfway mark, with the H-O-L-L-Y letters newly primed, primped, and painted. The effort started on October 2 and will be completed by year’s end. The remaining corrugated steel letters will be sanded and given a fresh coat of glossy white paint. When all is said and done, approximately 110 gallons of primer and 275 gallons of paint will have been used. And for sign aficionados who want to duplicate the color, it’s Sherwin-Williams Emerald Exterior Paint in high reflective white. 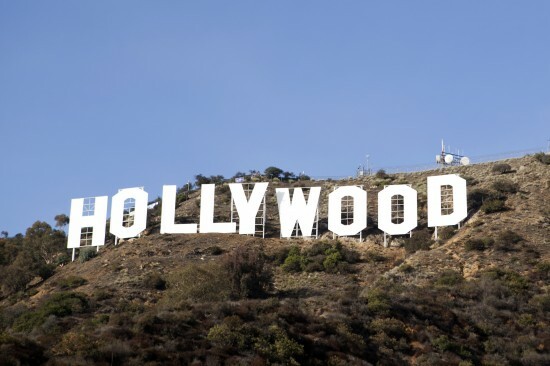 The Hollywood Sign Trust together with Sherwin-Williams is funding the project. The sign was originally built as a real estate billboard in 1923, scrapped and rebuilt in 1978 and today continues to be an international landmark.